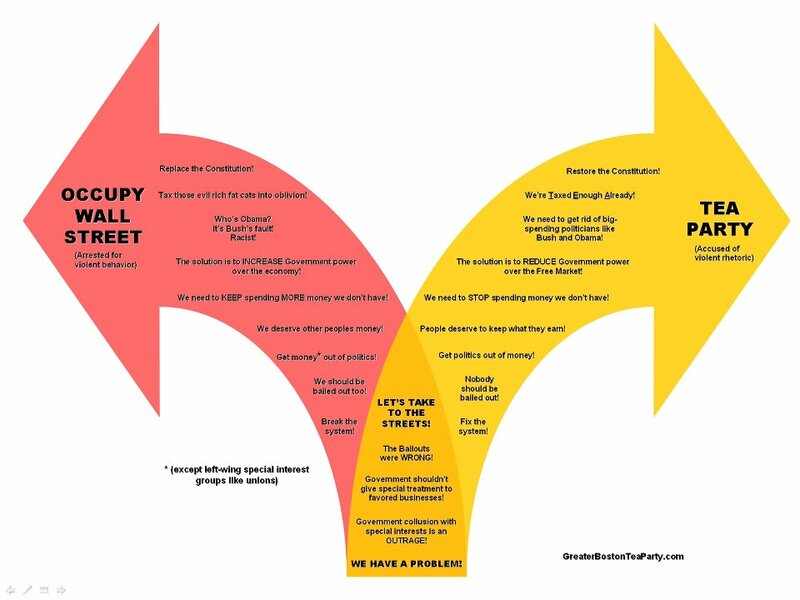 The Tea Party movement and the #OWS guys have a lot of original complaints and concerns in common. We both are annoyed at bailouts of huge corporations, we both are angry at the way government ignores us, we both are frustrated by cronyism between the mega rich and government, and we both have taken to the streets. The Tea Party took to the streets in response to the bailouts and stimulus. We'd had enough, after decades of tooth-grinding frustration and anger at the federal government, finally the final straw was reached. The catalyst, the trigger for the Tea Party was CNBC's Rick Santelli having a rant on TV about abuse of power, government arrogance, and misuse of funds. That set us off. What I want to know is: what was the trigger for the occupy movement? What set them off? Why at that point did they decide to camp all around America? What was their final straw? Because there was nothing that happened in culture or news to trigger it. So what made this start? And who? Because no one in the news seems to want to ask that. For what it's worth, I think the cultural event that spawned OWS is the Arab Spring. Early in the movement it was cited by both Adbusters and the whackadoo Anonymous folks as their inspiration, calling their movement the "American Autumn". The main difference in how it developed is that when Rick Santelli had his rant, he set the movement in motion and was pretty much done with it after that point. In the case of OWS, it was conceived, branded, and implemented by the anti-capitalism Adbusters organization, and after the Anonymous group lent their support it grew into something bigger. I don't know if I'd quite call it astroturfing, and at this point it has grown beyond that anyway, but it's roots certainly weren't as populist as the Tea Party. OK but Arab Spring happened in... the spring. So why did it take until Autumn? This doesn't exactly take a lot of organizing, although I do agree that this wasn't a genuine grass roots popular uprising so much as yet another leftist protest that for some reason caught on. Well now Christopher it gets darn hot in the summertime. You don't expect revolutionaries to risk exposing themselves to heatstroke and sunburn, do you? The Autumn of Obama's (dis)approval rating may have been the catalyst. Like stephen said - the Autumn result killed him.